I started to become interested in the effects of hormones on emotions during my MSc psychology upon learning that the effects of some neurotransmitters could be mitigated with others. States of Mind uses caricatures to explain how both the environment and past and present experiences can influence the release of hormones. States of Mind Investigates theories on how hormones influence emotions. Hormones such as adrenaline, serotonin, melatonin etc. 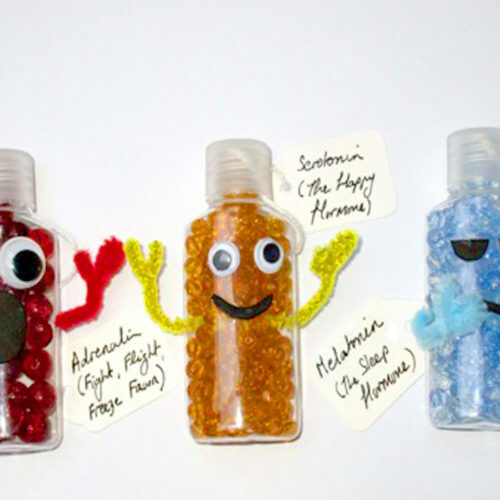 are depicted bottle characters that can be mixed and matched to create various states of mind. This is an ongoing project, which I believe could be used to promote health and wellbeing. An investigation into if and how biological structures on the microscale can be applied to macroscopic architecture.